One day a year comic book stores across the country and beyond seek to lure readers new and old into their musty lairs with a selection of colorful free reading material. Today is the Day of Free Comic Books. Or Free Comic Book Day. I like my way better, but if I had my way I’d be at my local comic book shop instead of just telling all of you to get to yours. 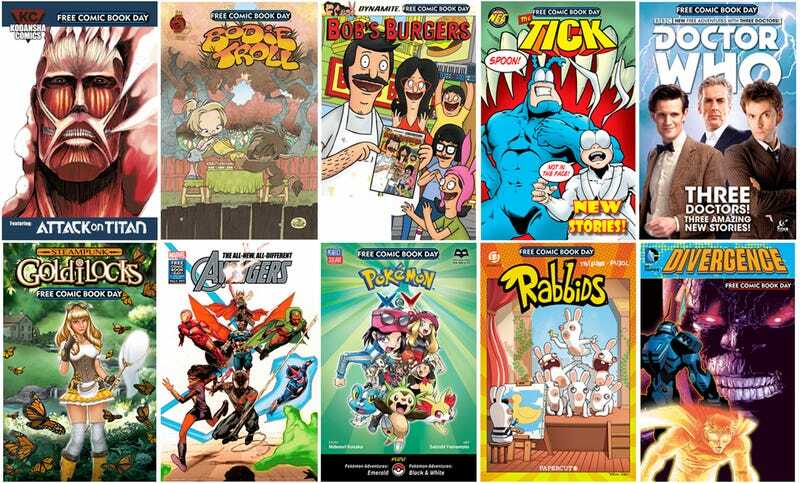 Celebrated annually since 2002, Free comic Book Day is a celebration of visual storytelling aimed at drawing new readers to the medium, bring lapsed readers back and reward the support of dedicated fans. Publishers from Marvel and DC to Bob’s Basement Comic Book Company trot out some of their finest wares, resulting in a spread that represents all the medium has to offer, from superheroes to video game characters, “funnies” to deep drama. Here’s how it generally works. Any person can walk into any participating comic book store (there’s a store locator at the event website) and pick up one of this year’s offerings for free. Getting more free comics than that generally depends upon the store. My once-regular haunt used to allow something like two free comics for every one normal comic purchased after that, or a set number of free comics per money spent. Since most stores line up big sales to coincide with the holiday, one can easily spend a whole lot on free comics. It makes sense somehow. Since I am stuck here in the office not attending, if someone would pick me up copies of The Tick, Secret Wars #0, Avengers #1 and the Mercury Heat debut, I would appreciate it. Enjoy incredibly crowded comic book store day, everybody!